This article is about the mountain range in Vermont. For other uses, see Green Mountain (disambiguation). The Green Mountains are a mountain range in the U.S. state of Vermont. The range runs primarily south to north and extends approximately 250 miles (400 km) from the border with Massachusetts to the border with Quebec, Canada. 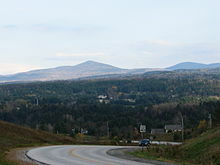 The part of the same range that is in Massachusetts and Connecticut is known as The Berkshires or the Berkshire Hills (with the Connecticut portion, mostly in Litchfield County, locally called the Northwest Hills or Litchfield Hills) and the Quebec portion is called the Sutton Mountains, or Monts Sutton in French. All mountains in Vermont are often referred to as the "Green Mountains". 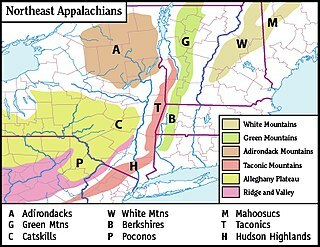 However, other ranges within Vermont, including the Taconics—in southwestern Vermont's extremity—and the Northeastern Highlands, are not geologically part of the Green Mountains. Jay Peak, 3,862 feet (1,177 m), receives the most snowfall on average in the eastern United States. The Green Mountains are part of the Appalachian Mountains, a range that stretches from Quebec in the north to Alabama in the south. 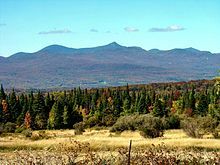 The Green Mountains are part of the New England/Acadian forests ecoregion. Three peaks—Mount Mansfield, Camel's Hump, and Mount Abraham—support alpine vegetation. Some of the mountains are developed for skiing and other snow-related activities. Others have hiking trails for use in summer. Mansfield, Killington, Pico, and Ellen have downhill ski resorts on their slopes. All of the major peaks are traversed by the Long Trail, a wilderness hiking trail that runs from the southern to northern borders of the state and is overlapped by the Appalachian Trail for roughly ​1⁄3 of its length. Vermont not only takes its state nickname ("The Green Mountain State") from the mountains, it is named after them. The French Monts Verts or Verts Monts is literally translated as "Green Mountains". This name was suggested in 1777 by Dr. Thomas Young, an American revolutionary and Boston Tea Party participant. The University of Vermont and State Agricultural College is referred to as UVM, after the Latin Universitas Viridis Montis (University of the Green Mountains). Lemon Fair runs through the towns of Orwell, Sudbury, Shoreham, Bridport, and Cornwall, Vermont, before flowing into Otter Creek. [clarification needed] The story is that its name derives from early English-speaking settlers' phonetic approximation of 'Les Monts Vert'. ^ "Berkshire Hills". Geographic Names Information System. United States Geological Survey. Retrieved 27 November 2016. Wikivoyage has a travel guide for Green Mountains. Wikisource has the text of the 1879 American Cyclopædia article Green Mountains. "Green Mountains" . The New Student's Reference Work . 1914.